Theme Park Press Releases: Nickelodeon Aquatic Adventure Zone Comes to Sea World Resort & Water Park! Nickelodeon Aquatic Adventure Zone Comes to Sea World Resort & Water Park! 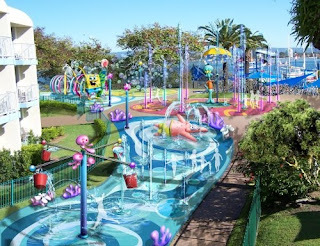 In an Australian first, Sea World Resort & Water Park is joining forces with Nickelodeon to bring an amazing new SpongeBob SquarePants and Dora the Explorer Aquatic Adventure Zone to the Resort just in time for Christmas. The Nickelodeon Aquatic Adventure Zone will feature three bright and colourful water-play areas themed around SpongeBob SquarePants characters including SpongeBob, Gary, Patrick, and Squidward. Highlights of the Zone will be a spectacular dancing water display, a giant spray bucket, and interactive water sprays. The Aquatic Adventure Zone will also feature a Dora the Explorer interactive sculpture, and Nick Jr. characters. The Dora the Explorer attraction will feature special character voice-overs offering guests a truly unique play experience. Sea World Resort General Manager Ernst Pfister said the Nickelodeon Aquatic Adventure Zone will be the ultimate attraction for families. “The Aquatic Adventure Zone is going to be extremely popular with families as the Resort brings the undersea world of Bikini Bottom to life through amazing special effects including the spectacular dancing water display featuring a mixture of water jets and LED lights, spray buckets, and water sprays. Sea World Resort will be integrating Nickelodeon into their Kids’ Club with specially designed SpongeBob SquarePants and Dora the Explorer activities and programs that the kids will love. Nickelodeon’s SpongeBob and Dora are also coming to Sea World this Christmas and construction is well underway for the world’s first SpongeBob SquarePants parade, a large-scale attraction for fans of all ages.